This heater core fits 68 Full Size Ford without factory A/C/ It is 100% new and comes with a 1 Year Guarantee We ask that you match up your heater core to this picture before placing your order as some catalogs are not 100% accurate. This heater core fits early 1960's Dodge, Plymouth and Chrysler applications. It is 100% new and comes with a 1 Year Guarantee We ask that you match up your heater core to this picture before placing your order as some catalogs are not 100% accurate. 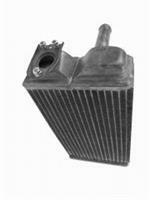 This heater core fits 54 to 56 Ford passenger cars and 55-57 Thunderbirds. It is 100% new and comes with a 1 Year Guarantee It uses a tubular style core design instead of the original cellular core design used by Ford. 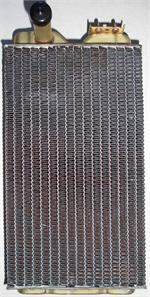 This heater core fits 57 to 58 Ford passenger cars and 58-60 Thunderbirds w/o factory A/C. It is 100% new and comes with a 1 Year Guarantee It uses a tubular style core design instead of the original cellular core design used by Ford. A bare bones way to shut off flow to the heater core in warm weather. Has 5/8" hose fittings. This heater installs easy and works great. Measuring 10" wide, 9" deep and 5" tall it won"t take up much room. Comes with 3 speed fan switch, inline fuse and neccesary wiring. The Mojave Plenum attaches to the front of the Mojave heater to provide directional control of the hot air Only adds an additional 2 1/2" to the depth of the Mojave Heater. 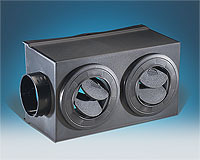 The Mojave Plenum attaches to the front of the Mojave heater to provide directional control of the hot air and also provides a flange for attaching a defroster hose. Only adds an additional 4 1/2" to the depth of the Mojave Heater.